The National Heart, Lung and Blood Institute created the National Cholesterol Education Program in November 1985 to inform the American public about the dangers of high blood cholesterol and how to lower cholesterol through lifestyle changes. Like high cholesterol, high triglyceride levels also increase your risk for atherosclerosis, stroke, heart attack, heart disease and diabetes. Your doctor can perform a lipid panel test on a blood sample to monitor your cholesterol and triglyceride levels. Many factors, including foods and medications, affect your blood and can cause false high triglyceride readings. All people over the age of 20 should have their blood tested for cholesterol and triglyceride levels at least once every five years. The test reports your total cholesterol, high-density lipoprotein, low-density lipoprotein and triglyceride levels. Healthy adults should maintain a triglyceride level of less than 150 milligrams per deciliter, and the American Heart Association has set the optimum level at less than 100 milligrams per deciliter. Doctors consider readings that fall between 150 and 199 milligrams per deciliter as borderline high, and readings over 200 milligrams per deciliter as high. Triglyceride readings of more than 500 milligrams per deciliter are considered very high and may require medication to treat. To obtain the most accurate results, you should provide a fasting blood sample. To fast, refrain from eating or drinking anything other than water for eight to 12 hours prior to providing the sample. Much of the dietary fat in food exists in triglyceride form. In addition, your body converts any unused calories into triglycerides. For these reasons, the triglyceride levels in your blood increase following a meal. 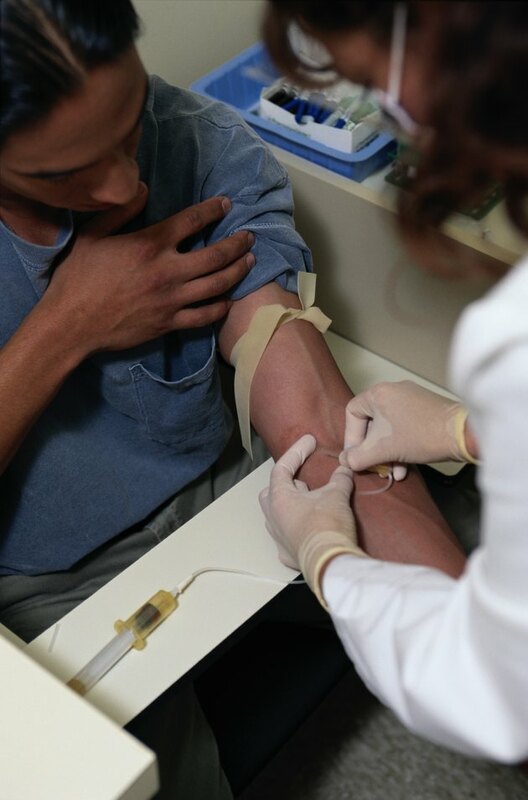 For screening purposes, doctors may obtain a nonfasting blood sample. If this sample provides triglyceride readings of less than 150 milligrams per deciliter, no further testing is required. Readings over 150 milligrams per deciliter may be false high readings and require another test using a fasting blood sample. Taking certain over-the-counter and prescription medications can affect your triglyceride levels and cause false high readings. Medications classified as beta blockers, prescribed for high blood pressure, cause false high readings. MedlinePlus lists cholestyramine, colestipol, medications containing the hormone estrogen, protease inhibitors, retinoids, certain anti-psychotics and birth control pills as medications that can cause false high triglyceride readings. To avoid false high readings, inform your doctor of all medications you currently take. Your doctor may suggest you temporarily stop taking the medication prior to the test, but only stop medications under your doctor's supervision. Drinking alcohol and smoking prior to testing can cause false results. Recent exercise and fluctuating hormone levels may also affect triglyceride readings, making them falsely high or low. If your doctor determines your high triglyceride readings are accurate, you can make changes to your lifestyle to reduce your levels. Lose 5 to 10 percent of your body weight to reduce your triglyceride levels by up to 20 percent, according to the American Heart Association. Change how you eat by cutting your consumption of carbohydrates to only 50 to 60 percent of your daily calories, and make sure added sugar accounts for less than 10 percent of your calories. Participate in moderate-intensity physical activity for 150 minutes a week to cut your triglycerides by 20 to 30 percent.